In December 2015, Kathleen Frederick and her husband, Charlie, recently retired from their teaching careers, were enjoying newfound freedom as they prepared for the holidays. Then came a shock: her younger brother, Tom, called to share that he’d been diagnosed with chronic myelomonocytic leukemia (CMML2). Doctors said the only possible cure was a stem cell transplant — and that his sister would most likely be the match. HealthCentral interviewed Kathleen by email about the journey she and her brother took to restore his health. HealthCentral (HC): How did you determine if you were a match for Tom? Kathleen Frederick: I headed to my family doctor for blood work to confirm that all my values were normal and indicative of being healthy. Testing for a stem cell match is simple; it just takes a swab of the inside of one’s right and left cheek and that’s sent to a lab. About a month later, I got a call that I was not a 10 out of 10 match. I was sad, but I knew he had a 9 out of 10 match in the database, so I assumed that person would be Tom’s donor. The National Marrow Donor Program requires the donor and recipient to have at least six corresponding markers in their human leukocyte antigen (HLA), a protein that helps the immune sys-tem detect rogue cells. Some centers prefer a match of seven markers. 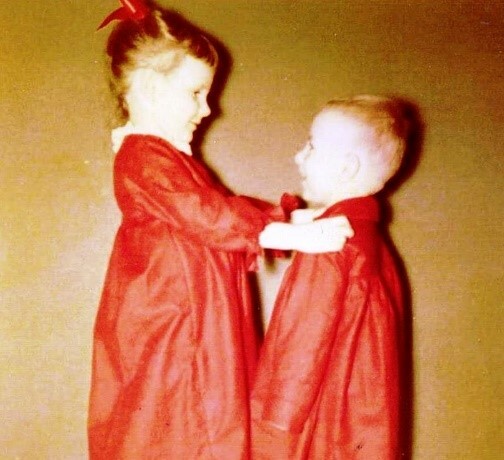 A sibling, except for an identical twin, has only a 25 percent chance of being fully HLA matched. The stronger the match, the greater the likelihood for a successful outcome. HC: Ultimately, who was selected? Kathleen Frederick: Weeks later, Tom called to say they were looking at doing a haplo transplant where the donor is not a full match, but matches the DNA in a way that would suggest the best outcome. A chat with his oncologist revealed that Tom’s DNA required some aspect of my DNA to work — and that is science far beyond this retired English teacher … I assumed that I would not be the match, that his daughter or son might be and both are much younger than I. Then Vanderbilt called to say that I was the donor. Honestly, I did not believe them: I thought there was an error as my age was far beyond the normal donor age. Age is a concern, because stem cells from younger people tend to be healthier cells. According to the National Marrow Donor Program, physicians usually seek donors between the age of 18 and 44 because that increases the likelihood for a successful transplant. Only in special situations will exceptions be considered. HC: With the match confirmed, what happened next? Kathleen Frederick: The Vanderbilt Bone Marrow Transplant Program in Nashville moved FAST. We had to make a trip to do all the pre-transplant blood work, EKG, chest X-ray, etc. This was in July. In August we left to do the transplant, but when we arrived, the transplant was cancelled. Tom was admitted for a month of intense chemotherapy. I stayed with Tom and [his wife] Fournet for about two weeks, and my brother continued the fight. In September, my brother rested in their apartment near Vandy; finally, he was ready, so I had to go again for the blood work — then home to get ready for our next trip for the real transplant. HC: What happened as you got closer to the actual transplant? Kathleen Frederick: Two weeks before the transplant date, I began taking Claritin to prevent long bone pain from the extraction; it worked. Tom and I arrived at Vanderbilt‘s Bone Marrow Transplant Center on the same day in October. Tom began five days of chemo to prepare for the transplant to totally wipe out his immune system. I started five days for Neupogen shots to my abdomen to increase my stem cells. Neupogen is a trade name for filgrastim, which is used to increase production of granulocytes, a type of white blood cell. It’s commonly used to help people with cancer whose white blood count has been lowered by chemotherapy, and it’s also useful in boosting white blood cells in healthy people prior to donating stem cells. HC: Did the injections cause discomfort? Kathleen Frederick: The shots were painless, and for three days I did very well, but on the fourth day I had severe headaches and vomiting. I called the transplant unit and was told to take four ibuprofen and promethazine, which I happened to have along because my family doctor always says to have it nearby; it controls vomiting. Both meds lessened my headache and helped me avoid the ER. HC: Did the symptoms last right up to your donation by apheresis? Kathleen Frederick: Yes — the staff in the apheresis department treated me with morphine and anti-nausea medication to have the collection go forward. As one nurse said, “If we have to put a breathing tube in you, we are getting your stem cells.” At that point, I began to feel like a prescription my brother needed from the pharmacy: I was an agent to his healing. That feeling remains with me because despite how wonderful it is to save a life, one has to be willing to give a great deal of time and energy and one’s own feelings of being valuable over to the fact that you hold the magic potion, and someone needs that magic. I knew that I was a means to an end that I hoped would work. HC: What happened after you donated the stem cells? Kathleen Frederick: My first response afterward was to go and see my brother. By the time I was released from day 2 of collection, Tom had already been given my stem cells; they are delivered through his port just like a transfusion. He was happy and upbeat. Then when I saw him the next morning, he was very sick: running a high temperature, wrapped in ice, chilled to the bone, and beginning to not make much sense. That day was horrible because what I had done to save him was making him so ill. All normal, just hard to cope with the fact that I made him this sick. HC: How did you feel physically after the donation? Kathleen Frederick: Once home, I was very tired, as all my blood levels dropped because I gave the good stuff to Tom. In about three weeks, I felt just fine. The journey of ten months was taking its toll on Charlie and me, but Tom’s journey was so much worse that we did not complain. We made a return trip in mid-November and over New Year’s to help them out. HC: What about the outcome? Kathleen Frederick: Waiting to see if Tom would survive this was a lesson in believing in the doctors. Tom spent six more months at the apartment near Vanderbilt. He was totally RESOLUTE about healing, and slowly he did. By about March, he had my blood type; I am O negative and he was A positive; he also has my blood DNA — amazing. And as of April, he was CANCER FREE, and right then, I could cry tears of joy! The trick now is to survive every new bone marrow biopsy with the same great news: no cancer cells! If he has a relapse, I could donate again. One big realization is that I am tied to my brother’s health for the rest of my life. Being a donor is forever. HC: Having the chance to save your brother’s life is phenomenal, and to him you certainly must be a hero. 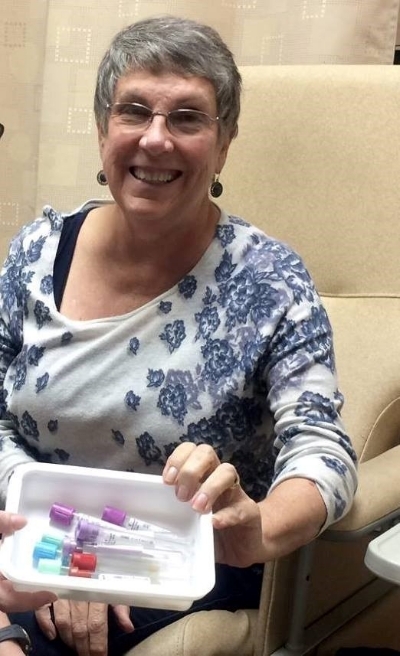 Kathleen Frederick: Everyone seems to connect joy or heroism to being a stem cell donor, but honestly, I do not think that I felt joy until April 2017 when my brother’s first bone marrow biopsy came back 100 percent cancer-free! That was 6 months after the transplant. I am certain I felt more trepidation at the huge task my 67-year-old stem cells were being asked to do. This is my brother, the longest friendship of my life. To have his life in my hands was pretty scary and overwhelming. I felt great motivation to give it my best shot. HC: By sharing your experience, you are helping others understand the priceless life-saving value of being a stem cell donor. The experience of saving Tom’s life must have been life altering to some degree for you as well. Kathleen Frederick: At 67, I assumed that my life-giving days were over; I had children and grandchildren, BUT with one phone call, I was able to give life to someone, my brother. I imagine what my parents would think about this story of bonding as adult children; I hope they are somehow connected to the world and know each day that Tom and I have connected in the most amazing way possible!